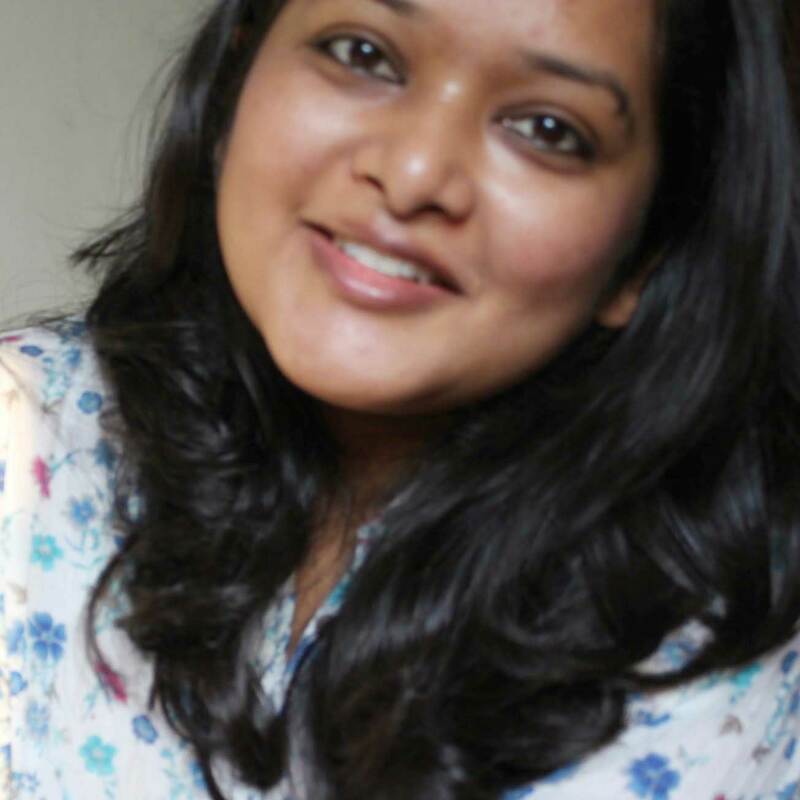 Travels and Stories: Maldives: An Islander's Tryst With God. Maldives: An Islander's Tryst With God. It was time of the year again, when my bi-annual craving for a holiday started alongside the urge of hiding away somewhere on my birthday. Seychelles is what i decided first, followed by Mauritius & then Bali. It had to be a perfect beach, like most of my favorite holidays. M was accompanying me this time. We contacted Tui, did researches online, but were still in many minds. Some one at my work place mentioned Maldives- and my first reaction- Oh no never ! I didn't want to go to a honeymooner's island ! But then, i still thought of giving it a shot & did my initial research. After looking at the pictures of islands, color of sand & water, airport & the water villas- i did not want to go anywhere else. I spent weekends doing research on maldives, checking out various resort properties, ways to reach there, expenses, hotel deals etc. We finalized on taking a Sri Lankan airline from New Delhi to Male, via Colombo. We booked our tickets & hotels. 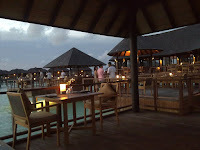 Our Colombo stay was booked in Cinnamon Lakeside for two nights & in Maldives it was Hilton Irufushi for four nights. All relevant links are provided at the end of this article. Eventually it was 31 August 2010 and we took our Sri Lankan airline flight for Colombo in the evening. Overall airline experience was not so good. It took us 2 ½ hours for check-in due to failure of electronic check-in at IGI airport, and then another 30 minutes for immigration, i could not have explained better to the officers on why am i single, why do i not 'design' (read fashion design) cakes & why i can't get my birthday cake for him ! We could not even get a glimpse of the new much talked about T3 terminal because we had to almost run to catch the flight after our check in. The aircraft in itself was comparable to one of those old days Deccan & food was well below average considering international standards. Anyhow, we landed in Colombo at about 2330 hrs . Immigration check was pretty quick with visa free entry. We took a private taxi to our hotel which was (like most of other hotels in the city centre) about 30 kms from the airport. Let me also put a warning here, the commuting- local taxis, tuk-tuks etc is pretty expensive in this city. We were pretty clear on our agenda next day- shopping. After all it was colombo, it was the city of MAS, supplying Victoria Secret to the world. We started late afternoon with the much talked about Odel Unlimited Department Store & were pretty disappointed. But let me start with the good part. The store's architecture is beautiful- its more or less like a french villa with seamless shops. Ladies & Cosmetics on ground floor, Home on second floor & Men's Kid's etc on the third floor. Overall store size was comparable to one of our Indian Shopper's stop. There is a french cafeteria- Deli France on the ground floor which is a must visit for its choice of breads, sandwiches, croissant, coolers, coffee & desserts. Do not hesitate to instruct the counter boy for that extra pickle or mayo that you might want on your sandwich. There is also an ice cream parlor right at the entrance of the store but we didn't stop by there. Well the good things end here. Odel's shopping experience & dirt cheap prices are over hyped by Sri Lankan media, trip advisor & even my lovely friends back in Delhi. Odel is not dirt cheap. And this i am totally saying from the point of view of some one who has been living in south Delhi for over 10 years & has been shopping there all this while. Out of sheer desperation, i had to buy a plain racer-back cotton vest and it costed me about 350 indian rupees. That's pretty much the price you pay back home, say in Alcott or Mango. Over all, the designs & silhouettes were pretty traditional. There were definitely a few lovely dresses & Tees but probably we had other expectations, so we chose to not buy here. Must add there was a small section for winter clothing & it was indeed dirt cheap. Next we moved to House of Fashion. This was mostly a multi level store selling everything from soaps to candles to dresses to coats to footwear. This store is mainly an outlet style store where rejects & over productions from Lankan exporters are brought & sold. Mostly the labels are cut, but we did come across names like EDC, CK, Gap, George. Being either rejects or over productions, you do not get many choices of sizes. And of course there are no trial rooms or even a rest room ! M, as usual was almost dying. We also went to Majestic City at last which is more mall-like. There were individual stores. The only brands that we could recognise were those of designer perfumes. And that was pretty much our shopping experience in Colombo. Overall its good for tourists from Europe & other western parts of the world because of the low price garments, accessories & other lifestyle products. For Asians, if you want to shop cheap- please stick to south-east Asia or India for that matter. We were back in hotel by evening, after resting for an hour or so, we set out for dinner at 7º North- an al-fresco style dining with mediterranean cuisine by the pool & lake side. Food, drinks, ambience, live jazz music & starry sky- everything was just perfect. Just a little inside me was a bit lost & confused. We checked out of the hotel next morning at 4000 hrs to take our flight to Male- sleepy & drowsy. It was only six in the morning that we landed ourselves in a Coffee Bean & Tea Leaves outlet at Colombo Airport. While everyone else was sipping their first coffee of the day, we were eating the biggest sandwiches ever along with a jumbo muffin. We were hungry. Not sure why. Any how we took our flight to Male where we landed in about one hour fifteen minutes. We found our Hilton representative right at the exit, who was standing with a hotel logo T shirt & guest list, like several other resort representatives. He helped us to check-in our luggage at Maldivian air-taxi counter. There are basically two air-taxi or sea plane services in Maldives- Maldivian Air taxi & Trans- Maldives Air taxi. They both are associated with particular resorts & therefore certainly do not have common guests ever. For resorts which are in the vicinity of Male i.e. within 20 minutes distance, mode of transfer is by Speed Boat. We then were transfered to Hilton lounge at the Air Taxi port which was five minutes bus drive from the main airport. After waiting for about 30 minutes and being treated with greetings, fresh juice, cookies and water we boarded the air taxi. Sea planes, as found here in maldives are 15 seater small air craft with a pilot, co-pilot & a host. They are simple, compact air crafts with lot of noise, so do remember to keep ear plugs. The ocean was the runway & the plane took off. The view down from the window was stunning. 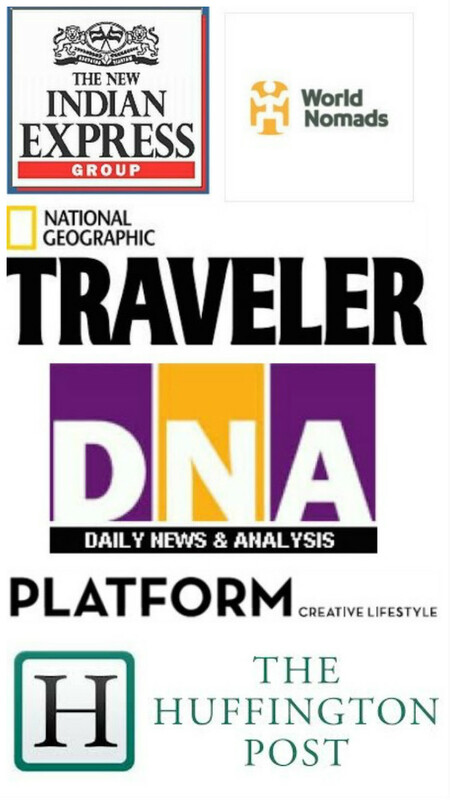 All my researches about maldives through internet, magazines & TV shows was coming in reality. Maldives is formed by a double chain of 26 Atolls stretching in a north-south direction off India's Lakshadweep islands. It stands in the Laccadive sea about seven hundred kilometers south-west of Sri Lanka. The atolls of the Maldives encompass a territory spread over roughly 90,000 square kilometers, making it one of the most disparate countries in the world. It features 1,192 islets, of which two hundred are inhabited. The Maldives is the smallest Asian country in both population and area. We landed at our resort reception area and were greeted & welcomed by our host Firaz, who took care of us for all days we stayed there. Firaz was a sweet & polite Maldivian boy of about 25 (i had thought so, but we later found out, he was 19). 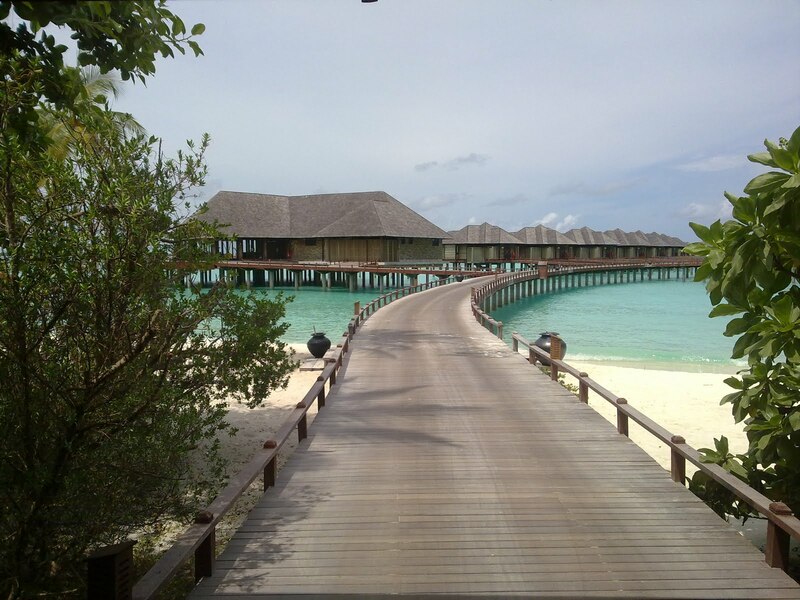 After doing the usual but short formalities of checking in, Firaz took us to our Beach Villa. There are choices of various types of villas or suites one can stay in. 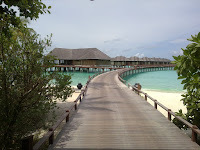 We decided to stay in a beach villa for two nights & then a water villa for the rest. The beach villa was extremely beautiful, private & spacious. The bedroom was with a king size bed, plasma TV, Bose speakers (think-viky-speakers), mini-bar, study table, paintings on either side of the room, french glass doors which open the way to a porch leading to the beach, free internet connection, corner couch. From one corner side of bed room was the dressing area with closets. Just next to the closets we noticed a massive wooden door which was the door to an open courtyard and also our bathing, i-spa & rest room area. This courtyard was the most beautiful part of the villa with two rain showers, two wash basins, toilet, i-spa tub, and a big comfortable seating area. We had fallen in love with our villa & soon after that in sleep. We were tired. We spent rest of the day sitting by the ocean, walking & admiring the nature. The next day started with an awesome buffet breakfast followed again by beach stroll. Firaz joined in a bit later discussing about India & his holiday plans for December. He also promised us to take us through the Celebrity villa & Hidden villa (in non-duty hours of course) as and when they get available. The information regarding these villas was not available on the website. Later, we rested in our i-spa which was very relaxing & refreshing. food was great. Its set up on top of the wooden planks jetting out on the ocean- some what like water villa architecture. There is underwater lighting just beneath the restaurant on all sides which makes the whole restaurant almost glow emerald green in the night. The tables are all set by the edge of the wooden planks, little topple can land you in the ocean, so just be a little careful ! With occasional spurting of water by a few fishes down, we finished our dinner and went to attend the Maldivian cultural evening being organized at the main bar, also known as Water's Edge. The place was done up with red glow lights, there were local male dancers, musicians & performers. One of the dancers approached M asking whereabouts of our 'husbands' and to his surprise we were by ourselves, he insisted us on joining him for the dance which does not seem to have much form in it. M, as always being courteous agreed to join & I gave one of my those expressions to keep him away. Some kiddies also joined M in the performance. Five minutes later we decided to leave, as the music didn't seem very musical to ears. That was the end of yet another wonderful day. It was the third day now and as usual we started with good breakfast & stroll by the beach. We had to shift to the water villa by noon. I was busy writing & M had already carefully packed up most of our bag & suitcase. There are choices of various day/night trips involving fishing, snorkeling, diving, champagne private cruise, visit to secluded islands, spa, water sports etc etc depending on your choices, preferences & pocket. With almost no extra money in our wallets, I decided to write as much as possible & together we decided to explore the island on foot & when too tired, using a club car. Such exotic holidays are mostly taken to reflect, ponder, think and probably do other such similar things. But nothing like that was happening. I was blank, as if the thought process had stopped. All the ideas that creep in when back home, have just vanished. There was emptiness. This write up was becoming more informative than a personal account. But i was truly content with this state of thoughtlessness. It was total bliss. Anyway, by afternoon Firaz came over and we moved in to our water villa which was, needless to say, by far the best residential unit I had ever experienced. As the name suggests, its an over water unit with a sea facing bedroom + sundeck + bathroom. It was smaller in size than our beach villa, but yes provided totally inexplicable experience. We paid bit more for this unit and it was totally worth it. Just a bit later in the day, Firaz took us to the Hidden Retreat & Celebrity Villa. They were pretty spacious 2-floor units with personal water pool, in-built home theater, karaoke system, snooker table, 4-5 bedrooms & kitchen. These villas were big and impressive. On my further probing, Firaz told us that the best & biggest & ofcourse the most expensive unit is the Aqua Retreat which is overwater set up like our water villa. While i was wondering what heaven would it be like, Firaz continued telling that its occupied by a Swiss family so we can not go & see it. We spent rest of the evening sleeping & resting in our new found haven. By evening we again got ready & headed to the Trio restaurant which is again my favorite overwater al fresco style dining with speciality in Mediterranean cuisine. Unfortunately, the menu had nothing in greens & only one dish of poultry. And that one dish costed us quite a fortune. But considering the ambience & fresh sea wind- we didn't mind spending that extra buck. We loitered back to our villa by late evening & after changing clothes, we put off all lights of the bedroom, went on the deck, got onto our sun beds (read star beds) & got onto best ever star gazing by the sea !! I dont remember when i last saw a sky so full of stars. It was such a paradise. We laid there over 2-3 hours, almost losing track of time. Suddenly the bell rang & to my surprise hotel had sent a birthday cake ! Oh yes, it was my birthday and it was indeed my first ever 'real' surprise birthday cake. I was wondering how did they know about my birthday, but anyways, we ate half of the yummy cake together & kept the rest to eat next day with Firaz. We were very happy gorging on the 'free' cake. M sang some silly stuff while i cut the cake, in my bid to thank her i proposed to do maldivian dance for her (in my style ofcourse). It had not even begun & M was almost rolling on the floor with laughter. We both jumped & laughed our hearts out to the sea. We were feeling so light in our hearts, in our minds & in our souls. Next day I woke up very late, managed to go and have breakfast on time some how. We had decided to spend the day in our villa itself, with a small evening drink at Reflections Pool Bar. The day was spent peacefully, with no much activity, just resting and lazying in and around our villa. I just wanted to soak up all the beauty around. We were leaving the next day. After dinner, Firaz joined in to eat his share of cake. But we all ended up chatting for over hours sitting over the deck, under starry sky & with his pack of camel. Firaz told us about his passion for football, cars, bikes, life & traffic system in male and of course indian films. He showed us his family pictures, of girlfriend and ex girlfriends. All of 19, he has already worked in customs at airport, then at a photo shop, now a host in resort, he is making money for his further studies. It was almost midnight and i could feel, he doesn't want to leave as he is feeling so connected. I felt good. For him. There came a moment between our talks that i felt that he was about to cry, but he didn't, which was good. He was very happy to know that we have nominated him for Star Bond (Hilton's some sort of employee motivational scheme), it was his first after all. After another half hour or so, he stood at the door to say bye. He stood for that extra second when i couldn't understand if he was expecting a hug or a tip probably. I was confused. We just shook hands & he left. Next day we got up early, finished quickly check-out formalities, followed by light break fast. While waiting to board the sea plane, we were given cute little octopus soft toys as a parting gift. Reached Male airport, and then to Colombo. It was a transit of over 4 hours, and M chose to sleep in the coffee bean shop. I was getting terribly bored. Somehow time passed & we took our flight back to Delhi. It was when I felt my first road bump in peak delhi traffic, i realized last 5 days spent on that island was nothing less than a tryst with God, amidst oh-so-perfect nature ! Sweetie .. how much was ur total expenditure? u got it done thru some travel agaent or site.. This is a very informative and detailed travelogue. I am sure if you get together your other tour details of past and future, a very good book may come up. Papa- Thank you very much. I thought you would be a bit critical (of the title atleast), but you are not. I am not able to record my past travels here because i dont remember much. Even if i try, it would not be as detailed as this one. But may be some off day i will try to recall and write. thanks ! :) But for future travels, yes i am definitely writing !